I've used vanilla cookies instead of the lady fingers when in a pinch with delicious results. 1. Prepare 2/3 cup of strong coffee. 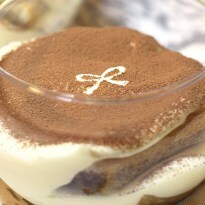 Then take one table spoon of sugar from 1/3 cup of granulated sugar for tiramisu cream. and add in coffee. Then stir to combine. 2. Now separate 2 eggs. (If you are concerned, use pasteurized eggs.) And add remaining granulated sugar into 2 egg yolks. And beat until thick and pale in color. Then add in 9 ounces of softened mascarpone cheese into the egg yolk mixture. And beat until silky smooth. 3. And beat 2 egg whites until soft peaks form. And add about 1/4 of egg whites into the mascarpone mixture and beat until combined. Then pour all of mascarpone mixture into egg whites. And gently fold until homogenous. This is how to combine dense mixture and light mixture. 4. Now transfer the sweetened strong coffee into a shallow dish and deep a ladyfinger, savoiardi in Italian, in coffee for 3 seconds. Then arrange on the bottom of a glass cup. Then spoon in the mascarpone cream, 2 or 3 tablespoons depending on the size of your cup, and flatten a little. Then repeat layers. Fresh savoiardi might get too soggy in coffee and cream, so make sure you use packed dry ladyfingers. 5. Cover with plastic wrap and refrigerate for at least 4 hours or until set. 6. Out of the fridge, dust with unsweetened cocoa powder. Today I am using a paper stencil. You can easily make your own. Just fold a paper in two. Then draw a pattern in half. And cut away with scissors. I love dusting cocoa generously.